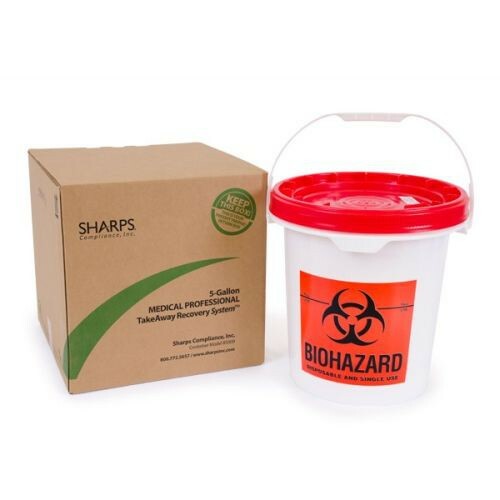 The Sharps Compliance 5-Gallon Takeaway Recovery System is designed for the collection of used healthcare materials, such as disposable syringes. The Sharps Compliance 85000 5-Gallon Biohazard Recovery System provides the proper and safe way to collect and dispose of healthcare materials. This system is ideal for dental, medical, and veterinary offices and clinics. This pail is easy to use, simply place used materials into the container and when ready for proper treatment, seal the container into the prepaid return shipping box and follow the clearly labeled instructions. You may also be interested in some of the smaller sharps containers, such as the 3-Gallon Red Sharps Disposal System and the 2-Gallon Red Sharps Disposal System.